This past weekend I went to the Sacramento Lindy Exchange. *drools* I had so much fun. 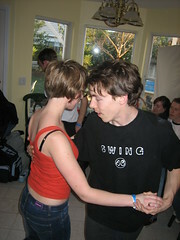 I hadn’t traveled to any out of state swing dancing events since September when I went to the Cleveland Lindy Exchange. It was good to be out dancing again at a big out of state event. I love traveling. To keep this short, I won’t go on and on about the amazing dancers I danced with. I hardly got any sleep… stayed up until at least 6:30 AM every night.Â Dance dance dance. It was fun, and that’s all. As usual, I forgot to take a lot of pictures. I managed to get 38, then accidentally deleted one so I ended up with 37. Lia April 11, 2006 at 12:24 PM So where is your blog of the DC exchange? On another note, I’ve decided the only problem with taking pictures of dancing is that you’re never in the pictures….so it’s your account of the event with no pictures of yourself. Anyways, just wanted to say hi! Aiti April 13, 2006 at 4:01 PM Hi Ryan, this is Aiti from Philadelphia, who was in car caravans leading people for Chinese food after the Sat afternoon dance at DCLX. Just want to say hi here because didn’t get a chance to say hi there. Sad you didn’t join us at dinner. Hopefully someday you can make it to the east again and we can make it up for you!! If you get a chance to visit Philly, don’t forget to come dance with us. Check out our forum for any update: www.phileswingdance.com. Ciao!! Parking in downtown DC is a nightmare! I just gave up and went somewhere else with some family that afternoon. It probably didn’t do me any good since I still had to drive a bit to find parking where I went (some indian restaurant). Oh well. :) Next time!